Once again, TMD Technologies Limited (TMD) world leading West London based microwave and RF manufacturer, exhibited at the EMV Exhibition and Conference in Stuttgart, Germany. 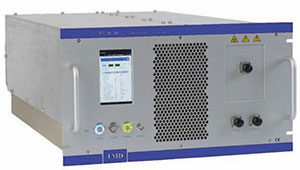 TMD has an impressive & proven capability in the EMC field, with products offering power outputs up to 50kW and operating over a frequency range from DC to 40GHz, using suites of Travelling Wave Tube (TWT) based & solid state amplifiers. The spotlight on TMD’s Stand C2-214 centred on the recently introduced PTCM Series intelligent, modular TWT RF instrumentation amplifiers. The compact PTCM Series are of customisable 6U high rack mounting construction. They are designed to deliver the highest field strengths in the test environment and to meet the most demanding worldwide standards. Operating over a frequency range from DC up to 40GHz with a power output up to 50kW, the amplifiers are designed for a range of applications that include EMC/radiated immunity, communications, EW, radar, RF component testing and the scientific field. ← Require a more technical or more appropriate work chair? We’ve got it covered!